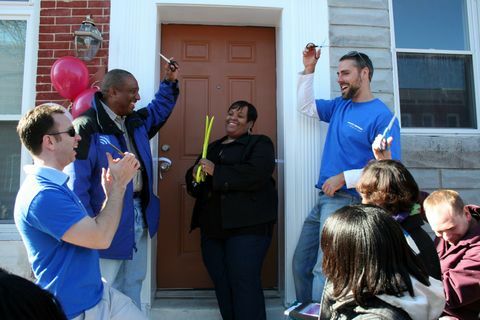 BALTIMORE, Feb. 3, 2010 -- What was once a condemned house at 1606 N. Gilmore St. is today the newly-renovated home of Leticia Smith and her family, thanks to a community partnership between Sandtown Habitat for Humanity and Northrop Grumman Corporation (NYSE:NOC). During a dedication ceremony and open house held on Jan. 23, James F. Pitts, corporate vice president and president of Northrop Grumman’s Electronic Systems sector, presented Smith and her family the keys to their new home, while thanking the 130 Northrop Grumman employees, family members and friends who volunteered more than 1,600 hours over a nine month period toward accomplishing the extensive home renovation effort. Under the guidance of Sandtown Habitat for Humanity representatives, the Northrop Grumman employee volunteers, families and friends worked on a variety of construction activities including wood framing, roofing, drywall, flooring and painting, among other tasks. During the ceremony, the Northrop Grumman executive announced that the corporation would be investing $50,000 in the year ahead to sponsor another Sandtown Habitat for Humanity home renovation effort. Sandtown Habitat for Humanity is a nonprofit Christian housing organization in the Sandtown-Winchester neighborhood of West Baltimore with the purpose of rebuilding the vacant housing in Sandtown, increasing homeownership and improving the health of the community.